1.For people with hirsutism: A cure to this kind of disease. 2.For people with exuberant hair: Safely, rapidly and permanently remove the excess hair on lips, neck, arms, back, chest, legs, arms, underarms, bikini, etc. 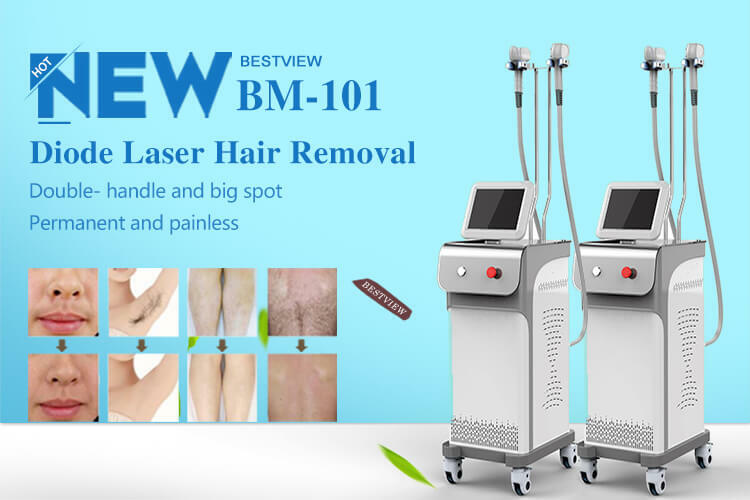 Based on the principle that different colors have different absorption of light, 808nm diode hair removal machine enables the laser with specific wavelength to pierce through epidermal follicles and be absorbed by the melanin in hair shaft. The germinal cells of follicles are damaged after receiving high temperature, which indicates the cease of hair growing and the achievement of hair removing. Radiator: With the price 3 to 4 times higher than ordinary aluminum radiator, high-grade copper radiator is used, super power making its heat dissipation effect better than others. 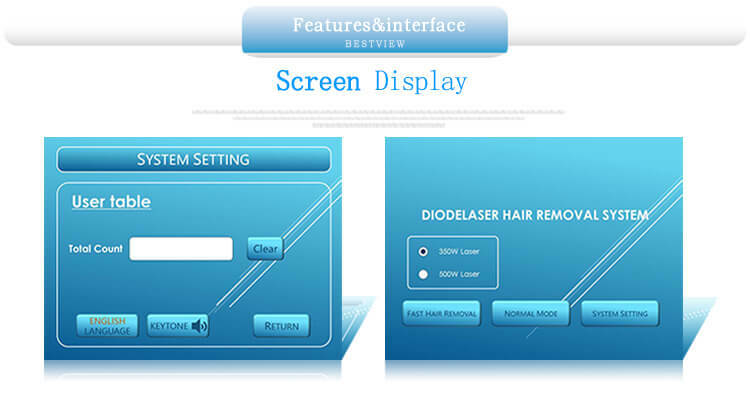 Screen: The 15-inch largest color LCD screen in China brings this double-handle diode laser hair removal machine imposing manner and noble temperament. Laser device: Using the macro channel encapsulation of imported laser chip, our laser device is manufactured by one of the most famous enterprise in Beijing, ensuring its top-ranking quality. 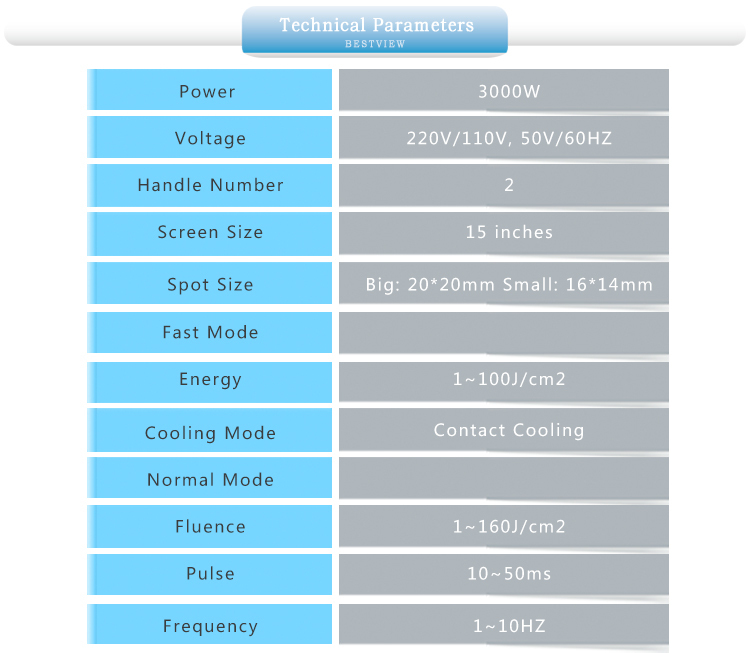 Power supply: This beauty apparatus adopts the high-power constant current power source produced by Taiwan MEAN WELL which is the number one brand in China. Water pump: This diode laser machine adopts the imported diaphragm pump with guaranteed quality and long lifetime. Electric wire: Three times more expensive than normal ones, Panda wires, China’s first brand, is put into use for the welding of this hair removal equipment. Appearance: With extraordinary and gracious appearance, our machine will become a landscape as soon as it’s placed in your beauty salon. Double hand pieces: Two hand pieces with different output power and spot sizes to treat the area with different size and energy requirement. Super large spot: The spot sizes of two treatment heads are 20mm*20mm and 16mm*14mm respectively, which can increase the operation speed immensely. Key switch and urgent stop button: The world famous brand, Schneider, adds much spark to both the key switch and urgent stop button.